This one will make you smile…. You are here: Home / reviews / Music Reviews Category / This one will make you smile…. If you thought Frankfurt was all about the Cocoon techno empire, think again. 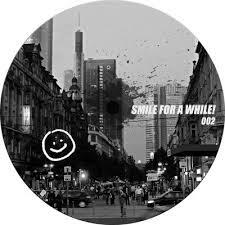 For a second time now Smile For A While are offering up a Various Artists compilation that proves the Germany city can do deep house as well as anything. Whilst you may not be familiar with the names here, each one to a tee comes up with the goods. My pick of the lot is Martin Heimann’s EP closer ‘Viol’, it’s a moody brew of deep space atmospherics with a nice groove floating you through the atmosphere as all sorts of planets float by. Elsewhere the offerings are just as good though – Eddoh’s ‘For What Will Come’ could easily fit into a rolling Fred P set for its dark shadows and doleful synths, whilst Honeo’s ‘HouKlaSam’ is a more upright, chord laced and pumping jam that bares plenty of 90s New Jersey hallmarks. Finally, Oliver Achatz get’s super lazy and low down on his elastic, supple and seriously slo-mo house grinder, ‘Machine Love’. It’s nicely textured and rounds out a properly connoisseur EP.